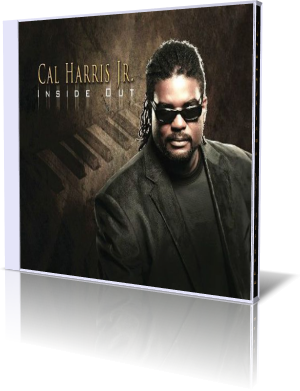 Cal Harris Jr. is a well-respected recording engineer, programmer, and keyboard player, who worked for music giants like Earth Wind and Fire, Lenny Kravitz, Prince, Whitney Houston, and Beyonce. But like many other musicians he has the insatiable desire to create his own project to show the world his talent as composer of solid, seductive, and infectious melodies through impeccable production. So he has released his debut album Inside Out. He has written, produced and arranged all songs, partly with the help of his music friends. Darrell Crooks (guitars), Yogi Lonich (guitar), Shem von Schroeck (bass), Harold Todd (sax, flute), Freddie Washington (bass) and Michael White (drums) are among the numerous musicians supporting this great project. The starting song Inside Out has that certain flavor spellbinding the audience in a quick way. Melody, arrangement and harmony are working hand in hand to satisfy listener's appetite for sultry tones. Appealing keys are Cal's trademark as he shows up with Hidden. If you love piano players like Tom Grant, Alex Bugnon or David Benoit, you will feel immediately at home. You cannot resist fine melodies like She Loves The Water, especially with Michael White's rhythm frame. The songs have a groove and flow like they raised out of an immaculate fountain of ideas. In particular the highly detailed sound picture like on High Tide is really captivating. Jukin mirrors the popular horn and key mélange, which made for example groups like Pieces of A Dream so admired. But honestly, Cal has a golden hand for striking arrangements. The first vocal track on this album Questions features blessed singer Tiarra Lemacks, the voice behind Michael Jackson, Brandy, Nelly Furtado and many greats. She just launched her debut single Lethal, enthusing friends of R&B. After the interlude One Day Cal presents the dreamy Soon As I Get Home. He knows the secrets to create the right mood to soothe you into a state of relaxation and readiness for romance. There are certainly several different ways to approach the blues. Millennium Blues is Cal's personal attitude to this musical style. With Secrets he introduces a picturesque and epic soundscape into his album. 2 Am closes the album with more sound impressions. Every debut album is of particular importance for the artist. Inside Out is Cal Harris' masterwork of creativity. Watch out for more of this great composer in the future.